a spiritual teacher in the ancient Indian subcontinent and the historical founder of Buddhism. He is universally recognised by Buddhists as the Supreme Buddha of our age. The time of his birth and death are unclear, but most modern scholars have him living between approximately 563 BCE and 483 BCE. 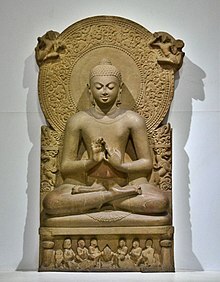 By tradition, he was born with the name Siddhārtha Gautama (सिद्धार्थ गौतम) and, after a quest for the truth behind life and death, underwent a transformative spiritual change that led him to claim the name of Buddha. He is also commonly known as Śākyamuni (शाक्यमुनि, “sage of the Śākya clan”) and as the Tathāgata ("thus-come-one" or "thus-gone-one"). This page was last edited on 6 March 2018, at 16:04.